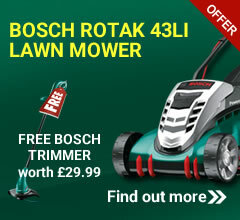 Comes with a FREE Ego Power+ 56V LB4800E Blower Unit worth £139.00 - While stocks last! Includes 5.0Ah battery and infinity fast charger. 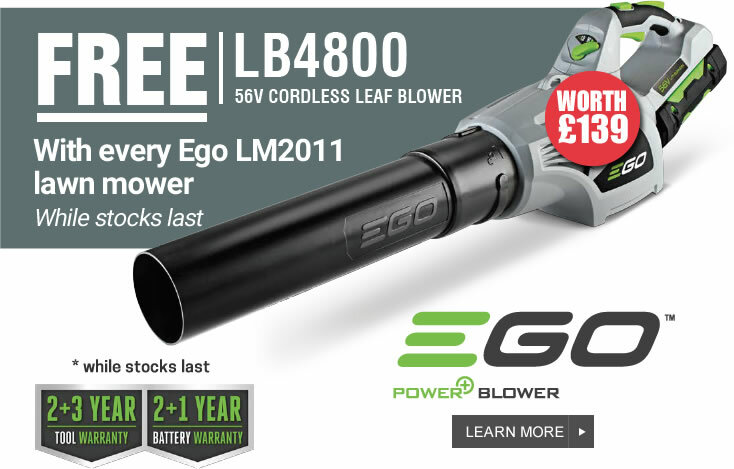 The EGO LM2011E Power+ 56V is significantly quieter than a petrol mower and with far lower service costs and zero emissions during use, the 50cm EGO Power+ mower features a hard wearing steel deck with a large cutting capacity. This lets you comfortably tackle any lawn in less passes, while the large capacity bag needs emptying less often. Plus on a single charge our battery gives you up to 40 minutes run time. Automatic Variable Speed delivers optimal cutting speed to maximise battery run time whilst maintaining grass cutting performance. The 3-in-1 functionality lets you bag, mulch or side discharge clippings while the LED headlights let you work further into the day. And when you’re done, the easy-fold design makes cleaning and storage simple. The EGO LM2011E 56V Lithium-Ion Mower delivers long-lasting power, rapid charging and durability in all weather conditions. Equipped with a NEW 20” steel deck and a run time of up to 45 minutes (with included 5.0Ah battery), there will be no problems getting your job done. The advanced EGO POWER+ 56V ARC Lithium™ battery uses industry-leading technology to deliver Power Beyond Belief and is compatible with all EGO POWER+ products. The EGO Power Plus 56v batteries can be interchanged with all their garden machinery. The EGO Power+ system delivers petrol-matching power but without any of the downsides. It’s simpler, cleaner, quieter and with less vibration is more comfortable to use. With lower running and maintenance costs, switching to EGO Power+ will lead to long term savings. Plus, with zero emissions during use, you can do your bit to reduce your impact on the environment too. Industry leading warranty on all Ego Power+ cordless machinery!! A breakthrough in every way, EGO is powered by the industry’s first 56-Volt Lithium-Ion battery. This means the entire POWER+ line—the mower, blower, string trimmer, hedge trimmer, and chainsaw — has been designed to deliver a new level of performance. Plus, EGO lasts longer. It charges in just 30 minutes. It Is intuitive, quiet and dependable. It provides all the power you need to get the job done right. Ego bring you the very first line of cordless garden machinery able to deliver the power and performance of petrol machines. Ego are a global organisation with a 20 year history of delivering professional quality and breakthrough technology have spent over 10 years researching, developing and perfecting their industry-leading cordless range. Their aim was always to convert dedicated petrol and electric users to their innovative cordless range. Running costs are approximately one tenth of those for petrol powered equivalents. This factor, plus reduced noise, vibration and a total absence of operating emissions, is a compelling environmental argument in favour of Ego. The whole range are powered by the same 56-Volt, Lithium Ion batteries which are an industry first. These batteries can achieve 100% charge in 30 minutes and can be interchanged between each Ego product to really utilise the benefits of the battery. 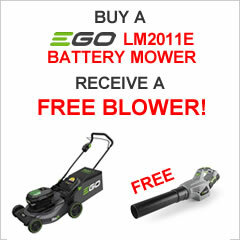 Ego’s product range includes, a lawn mower, two grass trimmers, a chainsaw, a hedge trimmer and two leaf blowers. You can choose from three 56 volt batteries (2Ah, 4Ah, and 6Ah), and either a standard or a fast charger. Used today with the 7.5AH battery and was really impressed, it lasted 70 minutes on one house and another 30 minutes on the second house before the battery run down to red. 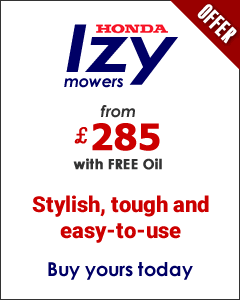 The mower itself is great, cut really well, easy to move and I'm really glad I purchased it, and again the added bonus is very little maintenance needed compared to petrol ones.